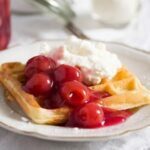 How to make thick and crispy Belgian waffles at home, a perfect Sunday breakfast or a really decadent dessert when served with cherry sauce and whipped cream. We do love waffles in Germany! I know this is the recipe for Belgian waffles and they are indeed Belgian waffles, but they are not very much different from the way we make our regular waffles in Germany. What is the difference between Belgian waffles and regular waffles? Well, there is not a huge difference. From my point of view the biggest difference is that we bake the Belgian waffles in a Belgian waffle maker, which makes rectangular, thicker Belgian style waffles, while the German everyday waffles are baked in a heart shaped waffle maker, which makes – obviously – heart shaped waffles, which are thinner and more delicate than the Belgian waffles. I could not really say which I like best… I like the heart shaped waffles, they are pretty and I like the fact that you can sprinkle one with powder sugar, roll it or fold it and eat it on the hand, like some kind of a thicker crepe. 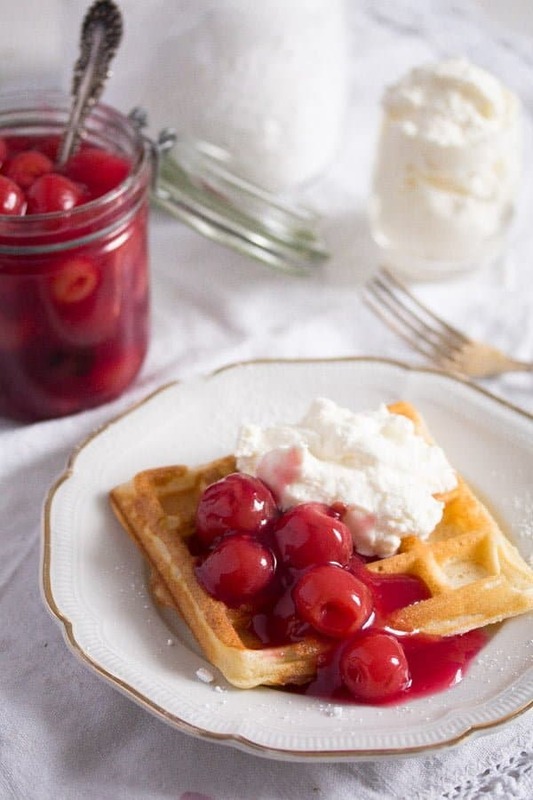 And I like the Belgian waffles because they are thicker and more appropriate to eat with my favorite topping: cherry sauce and whipped cream. Also they are crispy on the outside and fluffy on the inside, something that the German heart shaped waffles are not, they are thinner and softer and if you leave them for longer in the waffle maker, they will get very crispy, not only on the outside but all through. Belgian waffles were introduced in America by a Belgian person, Maurice Vermersch. His recipe was actually the recipe for Brussels waffles, but he changed the name into Belgian waffles because he thought that not many people would recognize Brussels as the capital of Belgium. The Belgian waffles became a huge success in North America, where they started being served with a topping of sliced strawberries and whipped cream. 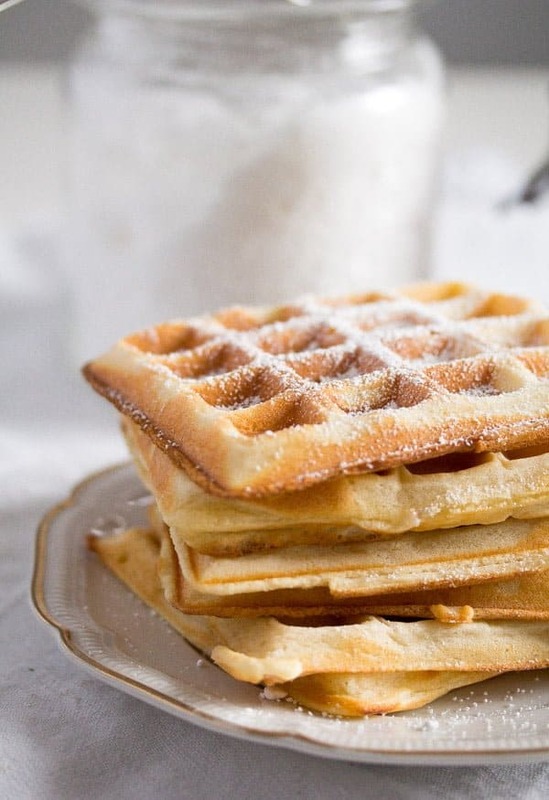 Nowadays, you can top your Belgian waffles with just about anything, although I have to say, that just a sprinkle of powder sugar would be enough for me in most cases. 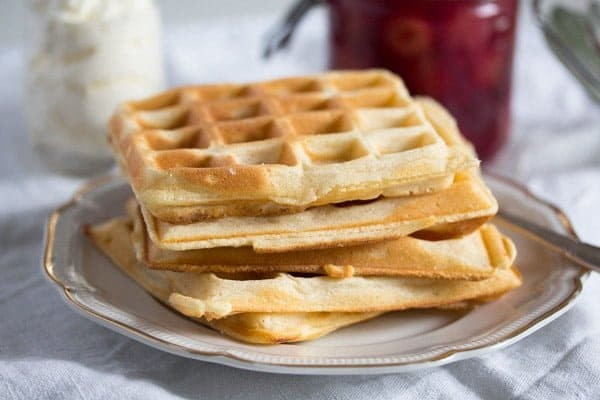 I do like the waffles as they are, I like their taste and texture and unless I am really in the mood for a sumptuous dessert, I am happy with eating a plain waffle sprinkled with just a hint of powder sugar. When still studying in Germany, ages ago, I used to work at the local flea market. The market was a huge hall with many different areas where people would bring their stuff and try to sell it on a Saturday and a Sunday, once a month. We used to have these ancient Belgian waffle makers, battered and old, needing to be greased before each batter addition, difficult to clean at the end of the working day. But, they made the best waffles ever, absolutely perfect: thick (thicker than I manage to make with my own waffle maker), totally crispy on the outside and fluffy on the inside. Such good Belgian waffles, that many people were coming on the weekend we had opened just for the waffles, they didn’t even go inside the hall to the actual flea market. They were eating their waffles with cherry sauce and whipped cream and many of them were ordering extra waffles to take home and reheat the next day. I still use the flea market recipe to make my Belgian waffles at home. We used to make it in huge buckets there, we needed about 6 batter buckets every day and we used to stir that amount of batter with an agitator machine, the kind my husband uses for mixing lime wash paint. So, I had to scale down that recipe a lot. 🙂 And I also changed two other things: first of all, I use butter instead of margarine (which was used there because it was much cheaper than butter) and nowadays I prefer to whisk the egg whites before I fold them into the batter. We didn’t do that at the flea market, because it would have meant a lot of extra work and with those amazing waffle makers, there was really no need for it, the waffles were thick, airy and perfect as they were. But when making the waffles at home, I do have the extra minutes needed to whisk the egg whites and I really feel that this step makes the homemade Belgian waffles fluffier.
. Mine only cooks two waffles at a time, but next time I buy a waffle maker I am definitely choosing one that is able to bake four at a time, such a time saver.
. I actually use this more often than the Belgian waffle maker, because it is quicker. The waffles are thinner, so they need less time to be ready. Usually the waffle makers don’t need to be greased before baking the waffles, but make sure to read the waffle maker’s directions for use before starting, especially if the waffle iron is new and you are not familiar with it. Step 2: Separate the eggs. Give the egg whites and a pinch of salt to a bowl and beat the egg whites until soft peaks form. Set aside. Step 3: Mix the soft butter (or margarine, if you wish) with sugar, vanilla sugar or extract. Add the egg yolks and mix to incorporate. In Germany, we would definitely use vanilla sugar, but if that is not available, you can replace with ½ teaspoon vanilla extract or a few drops vanilla aroma. See below for instructions on how to make vanilla sugar at home. Step 4: Mix the flour and baking powder together. You should sift them as well for fluffier, airier results. Give them to the butter mixture alternating with the milk, stirring after each addition and starting and finishing with the flour. Step 5: Add the mineral water and stir again shortly. Step 6: Carefully fold in the stiff egg whites. Step 7: Bake the waffles according to the directions of your waffle maker. My waffles took about 6-7 minutes to become crisp and nicely browned on the outside, while remaining soft and fluffy on the inside. My waffle maker also has different temperature settings and I prefer using a medium high one, for instance 4 or 5 out of 6 temperature settings. But that is a matter of personal taste, adjust the temperature setting accordingly. 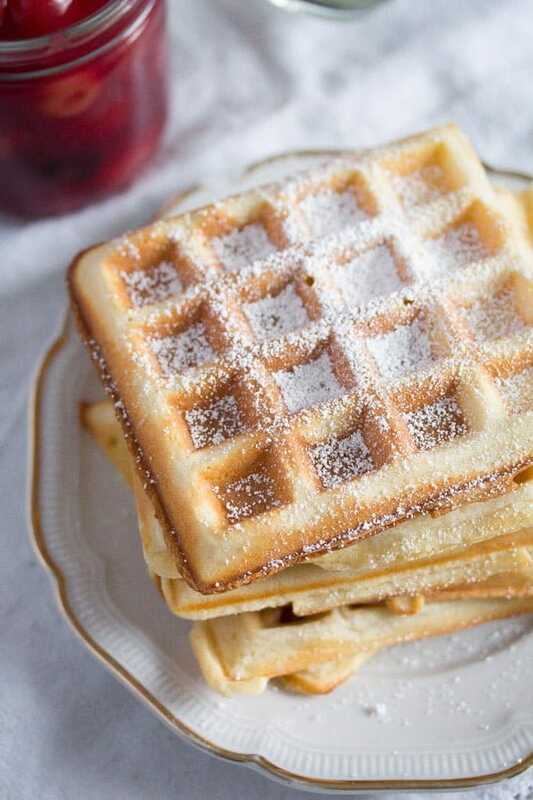 Sprinkled with powder sugar is the most common and practical way of serving Belgian waffles. This way, you can also eat on the hand, the way they are typically eaten in Belgium. The German way of serving them is with cherry sauce and whipped cream sweetened with vanilla sugar. So good, you should definitely try this version!!! 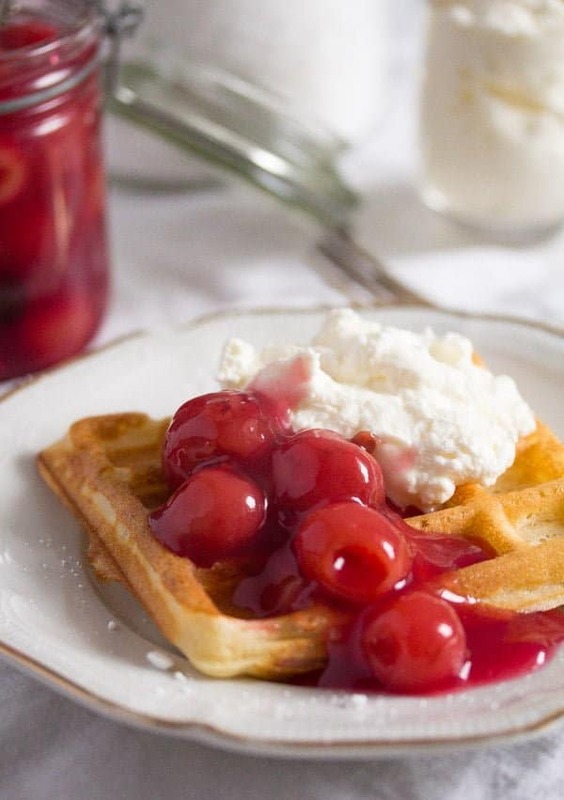 The American way of serving Belgian waffles is either with sliced strawberries and whipped cream, with different kinds of syrups, like maple syrup for instance, but other sorts as well. Any kind of berries, topped with whipped cream and drizzled with syrup or runny honey would be great as well. Belgian waffles keep well for one or two days. Let them cool completely, then give them to an airtight container or wrap them well in cling film/plastic foil or aluminum foil. When ready to serve again, you can easily heat the waffles in the toaster. Alternatively, place them on a baking tray lined with baking paper and reheat at about 100 degrees Celsius/ 200 degrees Fahrenheit until warm and crisp again. The waffles can also be frozen. Wrap them tightly and freeze them. Reheat them as instructed above. You can also eat cold waffles. We often eat the leftovers for breakfast, topped with jam (strawberry, apricot etc) or a little runny honey. To make your own vanilla sugar, give some granulated sugar to a bowl and stick a vanilla pod in the sugar. Place the lid on and use as needed. Stir the sugar from time to time (when removing some for using in recipes for instance). You can refill the jar with sugar many times before the vanilla pod would stop being able to flavor the sugar. Alternatively, you can use empty vanilla pods to make vanilla sugar. Cut the vanilla pods into pieces and give them to a food processor together with granulated sugar. Process until you obtain a powder. 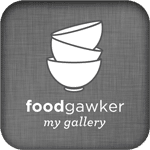 Fill in jars and use as needed in a recipe. See blog post for instructions on how to make vanilla sugar at home. Separate the eggs. Give the egg whites and the salt to a bowl and whisk until stiff. Set aside. Give the soft butter, sugar, vanilla sugar or vanilla extract to another bowl, mix until creamy. Add the egg yolks and mix well until the sugar is dissolved. Sift together the flour and the baking powder. Start adding them to the butter mixture alternating with the milk. Start and finish with the flour. Stir in the mineral water as well. Carefully fold in the stiff egg whites. Bake the waffles according to the directions of your waffle maker. My waffles took about 6-7 minutes to become crisp and nicely browned on the outside, while remaining soft and fluffy on the inside. My waffle maker also has different temperature settings and I prefer using a medium high one, for instance 4 or 5 out of 6 temperature settings. But that is a matter of personal taste, adjust the temperature setting accordingly. Give some batter to the waffle iron, regarding the instructions of the waffle maker again. Close the waffle maker and bake until the waffle is golden. Usually, the waffle makers will have a way of letting you know that the waffle is ready, either a (green) light or it will make some kind of sound. But that depends on the waffle iron you are using. Keep the waffles warm in the oven by 100 degrees Celsius/ 200 degrees Fahrenheit until you are finished with baking. 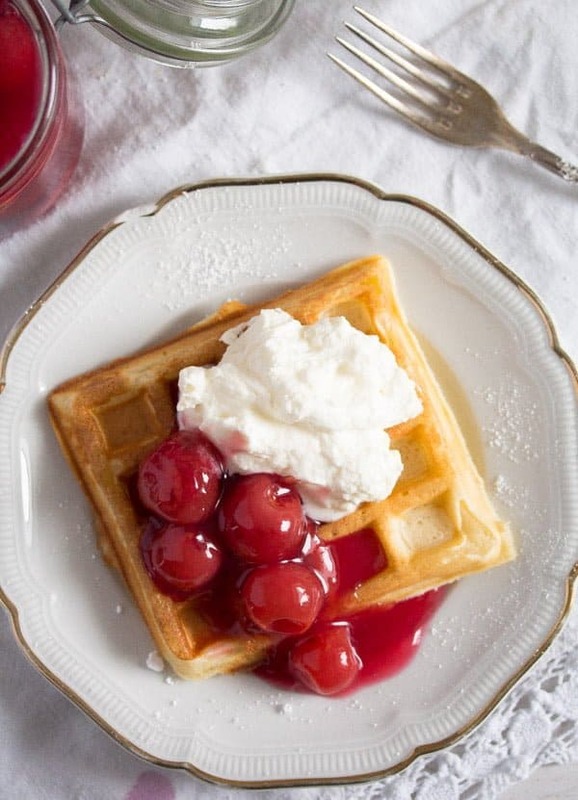 Serve the waffles warm with cherry sauce and whipped cream or as suggested above. The waffles can be baked in advance and reheated in the oven at about 100 degrees Celsius/ 200 degrees Fahrenheit until warm and crisp again. The waffles can also be frozen and reheated the same way or in the toaster. I was thinking of making Belgian waffles, as they look fab and are delicious too. But I don’t have a waffle maker. I should buy one. Your waffles are so appetizing. These look delicious! Great information! 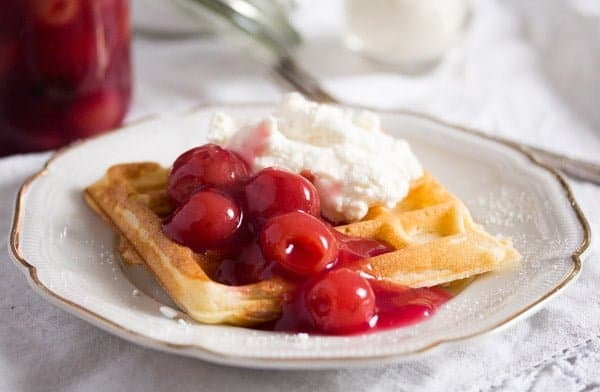 Waffles are the true beauties you know 😉 i love these cherries and yeah I am waiting for the blueberry sauce recipe because i have tried this blueberry waffles just a few days and i loved that..hope you will share soon.